Home Electronics & Gadgets Modem vs Router vs Switch: What Differences Do They Have? Although network switch, modem and router look quite similar in terms of their appearance, they have their own roles to play in a network system. They are found everywhere, right from the datacenter that is hosting Google to your home network. In case you are not familiar with them and their differences with each other, we have prepared this blog for you that you might find very informative. If you’re planning on getting a top quality modem or router for your home or office, you first need to know some basics. 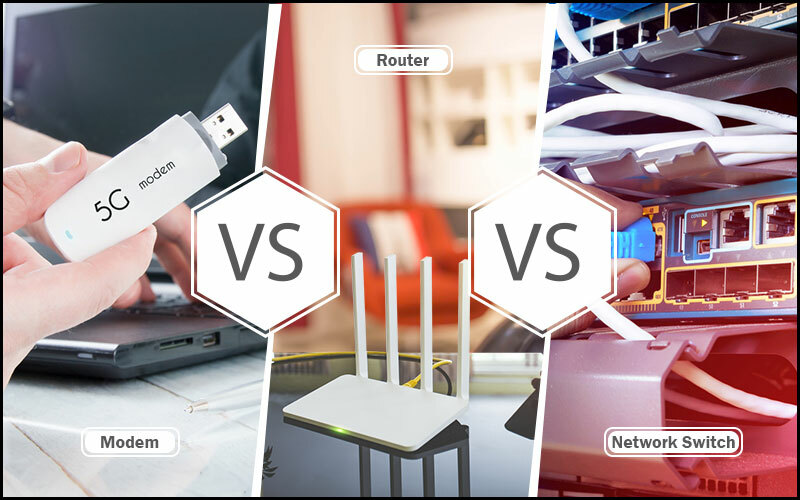 Read on to know all about modem vs router vs switch and the functioning of these major network devices. A modem is a small device that sits between your cable box or wall and your computer. If you have a DSL connection then it connects to the wall but if you are using cable lines then it hooks up to the cable box or coaxial cable available. The data sent to this device is translated to your computer display. You may know that information on computer is digitally stored but information sent and received over cable lines and phones is in the form of analog waves. What a modem does is it receives analog waves, transfers them to the digital form and provides them to your computer. There are different kinds of modems and you have to choose one based on the internet connection you have. Cable modems: they make use of coaxial cables whose one end is connected to the back of your modem and another end to the back of the cable box or the wall. This is often used for high speed internet. Dial-up: this is the oldest type of internet connection that uses phone lines to connect with an ISP. These modems are way slower than DSL and cable. DSL: you can connect these modems to such external modems as cables with different plug-ins, or to your PC with an internal modem that dials in through the phone line you have. This is a very common network device that allows data communication between the internet and your computer or smartphone. Almost every smart device of our everyday life are interconnected wirelessly. Routers connect modems like cables, fibers, or DSL modems to other devices for allowing communication between these devices and the net. Most routers, including the wireless ones have several network ports in order to connect several devices simultaneously. There are wired and wireless routers, virtual routers, edge routers, and core routers on the market. A router usually connects to a modem physically through the WAN or internet port and then to the network interface card (NIC) in your network device through a network cable. On the other hand, a wireless router connects through different wireless network medium to devices that support that specific media used. This provides better security to keep your information and computer or other devices safe and sound from any virus attack. This networking device is a tiny hardware device that is also known as MAC bridges, bridging hub or switching hub. To understand the core differences between modem, router and switch, you need to know the fundamental differences of internet and Ethernet. A switch’s main purpose is to centralize communication among several devices connected into one LAN or local area network. In fact, people used stand-alone network switches long before broadband routers became so popular. Any home router today directly integrates network switches into the device as its core function. High performance ethernet switches can still be seen in data centers and business networks. The typical ethernet switches, such as those used in broadband routers, support Gigabit Ethernet speed for every link, whereas the high-performance ones often found in a data center support 10 Gbps for every link. Various network switch models support various number of devices connected. While consumer-grade ethernet switches provide either 4 or 8 connection for ethernet devices, corporate switches usually support 32 to 128 connections. Below you will find the major differences between switch vs router vs modem. Allows connection to several devices Directs data in a computer network.